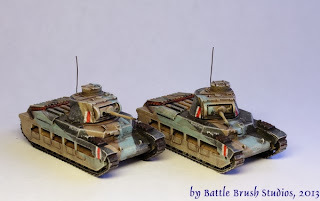 Today we are going to take a look at a 15mm model. British, lumbering, slightly old-fashioned, doesn't like anti-air guns: it's the Matilda Mk.II. These I actually got for an army of mine at Salute 2013. Travelling in my hand luggage explains the slightly dented look on the boxes. Speaking of which - let's have a look, shall we. Nice, standard artwork for a model kit. 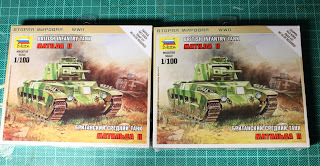 The models are from Zvezda of Russia, a well-known name in scale models. Recently they decided to get into producing wargaming kits as well, having even released their own ruleset, Art of Tactic. So far it's only released in Russia. For this game, and of course for everybody who's into 15mm WW2, they started releasing 1/100th scale simple snap-together kits. Mostly German and Soviet models but there are a few British and US ones out too. 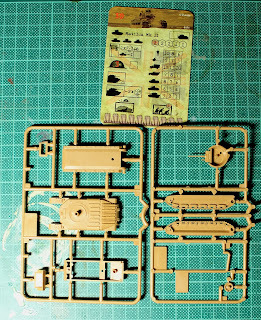 The back of the box has the building instructions and some additional pictures of the model and info about size. They also let us know that it's easy to glue and paint due to a "new material" used. Interesting. Now let's take a look at the insides. You get two sprues, assembly instructions and a stats card for using the vehicle in Art of Tactic. The card actually is of pretty nice quality. Still - no use to me, binned. Same goes for the little flag marker on the sprue. Now for the assembly. The "new material" proves to be very soft plastic. It's perfectly serviceable but watch out when cleaning it with a knife so that you don't cut too deep. By the way: There are practically no mould lines, hardly any cleaning is required. That aside be careful with the gun barrel and turret MG. They snap easily. 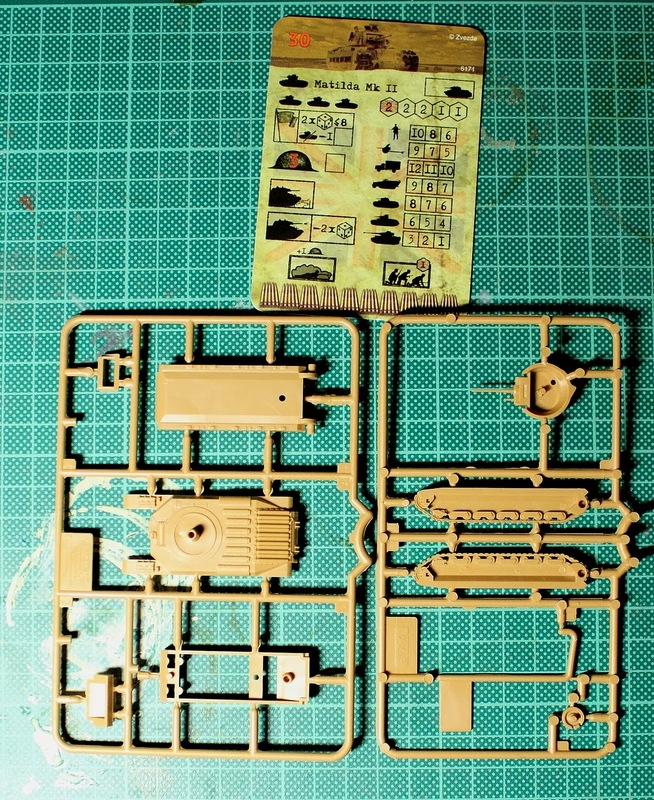 The assembly process is dead simple and the models are designed to be put together with only tiny amounts of glue used. The snap-fit connectors go together tightly which might require some force but they do stay together. Same goes for the turret which you better don't glue on. It won't come off either way so might as well have it turn-able. Assembly took just a few minutes, the parts fit perfectly well. However, there still was a little gap between the top and bottom parts of the chassis so I used some putty to fill those. The details on the whole model are a little flat, especially compared to metal- or resin-cast equivalents from other companies. It's not bad though. I have seen the kit criticized for lacking the pronounced exhaust pipes on the back. They are there though. 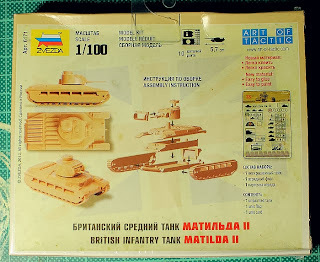 Again, not hugely pronounced but if you look photographs of the real thing I think the exhaust pipes are a bit overdone on some model versions of the Matilda II. I used the Caunter Scheme because what's the point in doing WW2 British in North Africa if not for that colour scheme? I am aware that the lighter colour is a tiny bit too blue but it just looks so much more characterful. 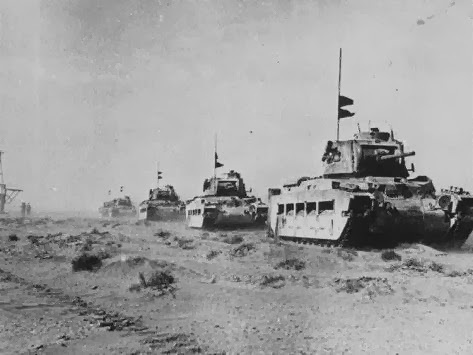 I also added the white-red-white vertical stripe markings used around operation Crusader. Unfortunately the models do not come with any decals. Not quite as problematic with British vehicles as it would be with say German or US ones, still it would have been nice to have some decals. 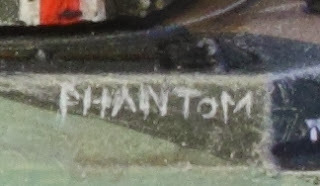 The vehicle nicknames were some of the fiddliest freehands I had done in a while, especially so as I did them on both sides of each vehicle. Those models are for my skirmish force so there won't be many tanks at all. Given that it pays off giving them individual names. 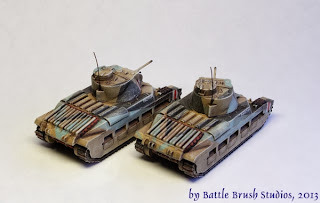 These were vehicles of the 42nd Royal Tank Regiment, 1st Tank Brigade. I took the names from this amazing compilation which I'm sure you will find very handy if you are collecting any British forces in WW2. Looking at the correctness of the size of the models: While width and height seem to be spot on, the model is about one to two millimetres short. It's hardly noticeable though. The verdict: I think I paid £2.00 for each of these models at Salute, usual store prices are around £3.00. On Amazon, weirdly, they charge £5.20 for the model. The price is the big point here. Battlefront's Matilda 2 (granted, it does come with a commander figure) costs more than twice of Zvezda's offering. Details are a little less pronounced but also finer than on Battlefront's models. It has to be said though that this model is rather basic. If you are gaming on a budget Zvezda's 1/100th scale models certainly is for you. As I said, their British and US ranges are very limited at this point in time, but for German or Soviet players Zvezda have a lot to offer in 15mm scale. I hope that you enjoyed my review of this very affordable kit. For any questions, comments and so on feel free to drop your messages here in the comments section, on the forums or contact me directly via Battle Brush Studios, the Battle Brush Studios facebook page or via e-mail! 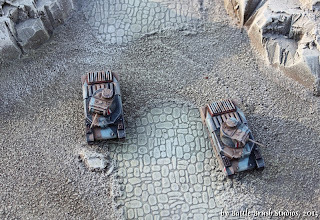 Don't forget that any WW2-themed painting/modelling project commissioned during all of December is -20%!